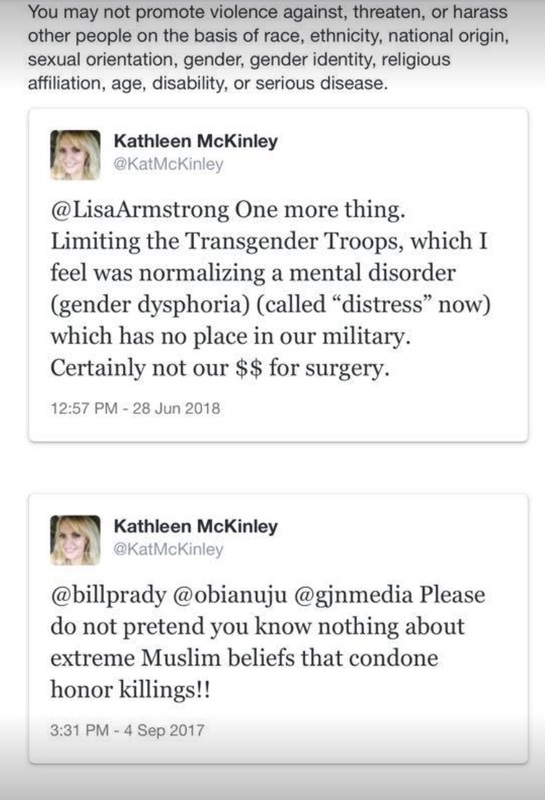 Kathleen McKinley, a conservative blogger and political commentator for a local Fox station in Houston, was surprised Friday to find an email from Twitter announcing her account had been suspended. Twitter listed two tweets that it claimed violated rules against “hateful conduct,” emails that McKinley shared with The Daily Caller News Foundation show. The belief that biological males who believe they’re women shouldn’t be cleared for military service is well within the conservative mainstream. That tweet had a specific context: McKinley’s friend Obianuju Ekeocha, an African pro-life activist, was in a Twitter debate about abortion with Bill Prady, a producer on CBS’ “The Big Bang Theory. At issue was whether pro-lifers should support exemptions for someone who claimed a religious right to abortion. Ekeocha’s answer was no, for the same reason that she wouldn’t support a religious right to honor killings. Prady’s response made him appear uncertain on whether he condemned religious honor killings (a fact he later acknowledged and called “inexcusable”). Ten months later Twitter ruled that tweet constituted “hateful conduct.” The company did not return TheDCNF’s request for comment. McKinley’s suspension came one day after a jury in her hometown of Houston found a Jordanian immigrant, Ali Mahwood-Awad Irsan, guilty for murdering two people in religiously-motivated honor killings. Irsan, whom prosecutors described as “a radical extremist Muslim,” killed two people and planned to kill three others “including his daughter, after she ran away from the family compound in rural Montgomery County, converted to Christianity and married a Christian man,” the Houston Chronicle reported.